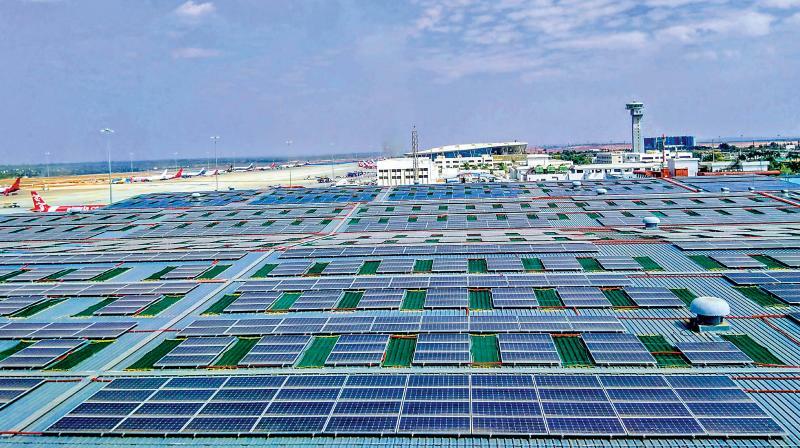 In a big energy saving move, the Kempegowda International Airport installed a 3.35 MW rooftop solar power plant to cater to its needs on Wednesday. With an annual solar generation of around 4.7 million units, the plant could see the airport become self- sustaining in power by 2020. Installed across eight rooftops at Menzies Bobba, Air India SATS, Coolport and several BIAL office buildings, the solar power plant is expected to reduce 3,800 tonnes of carbon dioxide emissions annually. The contemporary design of the solar panels ensures that the glare of the sun is not reflected for the safety of aircraft operations. The solar structure is also lightweight, leak-proof, corrosion-free and can withstand high winds. Commissioned across two phases, the project in its first phase in 2017 saw installation of a 503 KW rooftop solar structure, a 2.5 MW ground mounted solar panel and a 425 KW car parking solar power installations. 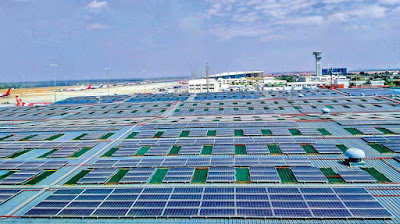 Rahul Dasari, MD and CEO, Sunshot, which has installed the plant, said the company was proud to be a part of BIAL’s sustainable energy initiative. The multiple roof types, and high security zone made it a challenging project, but his team had executed it in line with world class quality, safety standards and within the stipulated timeline, he added. “ We have used high efficiency Mono PERC Modules, which provide around 14 per cent higher electricity generation in the given space. High performance multi- MPPT inverters, quality structures from PVFix and Sunshot’s state-of-the-art, cloud-based energy management (IoT) system for real time performance monitoring of the plant, are some of the salient features,” he said. The BIAL authorities say they aims to ensure that the airport environment is fed by sustainable energy. Already, the street lights, perimeter lighting and airfield lights have been converted to LEDs, thereby reducing dependency on non-renewable energy,they note. Also, the projected energy generation from the solid waste management plant (to be launched in 2019) at BLR Airport has the potential to power 5,000 households / year and produce 1.5 million kgs of compost annually. BIAL has achieved 3+ Carbon Neutrality - the highest level of environmental impact achievement for airports. With a clearly-defined Sustainability Policy in place, BIAL is focused on making substantial contributions to sustainable development, asserts Hari Marar, its MD and CEO. “Being responsible in our actions and ensuring sustainability of the BLR Airport as we grow and expand is right at the heart of our mission and we consider ourselves pioneers in this area. At BIAL we are committed to achieving excellence in environment sustainability,” Marar added.